2017/1 - Blog - Harmony House Foods, Inc.
Harmony House Backpacking Soup & Chili Kit vs. the Trail Ready Soup & Chili Pack: Which is Right for You? Backpackers love our dried soup and chili mixes and blends because they are tasty, nutritious, lightweight, and easy to cook on the trail. To make meal planning for long distance backpacking trips simple, Harmony House offers two different dehydrated soup and chili variety packs. Yes, you can get all of the meals for your next backpacking trip shipped to you in one box! 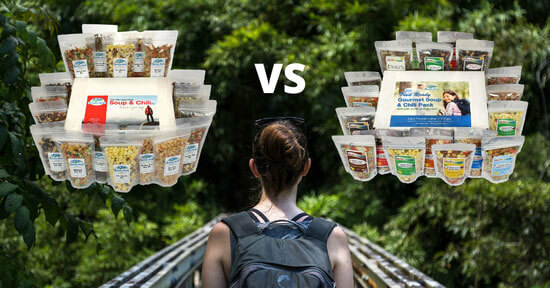 Hikers can choose between our Backpacking Soup & Chili Kit or our Trail Ready Gourmet Soup & Chili Pack. Get Newsletter Deals!Sign up for offers, new products, and recipes. 100% SATISFACTION GUARANTEE! Copyright Harmony House Foods, Inc. All Rights Reserved. *Free Shipping applies to lower 48 only.